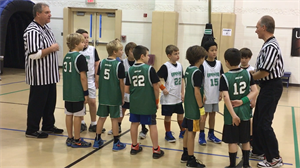 In our 7th season, Jarvis Memorial & St. James Upward Basketball League served close to 400 boys and girls with the help of over 150 community coaches, referees and church volunteers. Coaches discussed the virtues of SERVICE, CONTENTMENT and HOPE during the practice devotions this year with the children. Upward places a great emphasis on understanding a biblical virtue reinforced through a scripture verse. Therefore, three weeks of practice focus on the same verse and virtue.